MPSRLM Recruitment 2019: The Madhya Pradesh Rural Livelihoods Project (MPRLP) is registered under the Madhya Pradesh Societies Registration Act & it works with the local village assemblies & Gram Sabha to eradicate poverty in Madhya Pradesh. Hence, recently, the MPSRLM Recruitment Board has released notifications regarding MPSRLM Assistant District Manager Recruitment. Therefore, all interested & eligible candidates must go through the details provided in this article. As per the latest news, this year MPSRLM has announced 27 vacancies for the Assistant District Manager Post. The starting date to submit the online applications was 20th March 2019 & also the last date for submitting the online application was 07th April 2019. The exam date is yet to be announced by the MPSRLM Recruitment Board. MPSRLM Recruitment Board has released notifications regarding Madhya Pradesh Assistant District Manager Notifications & also MPSRLM Assistant District Manager Vacancies. We also provide proper guidance to the aspirants by publishing the latest MPSRLM Syllabus & Exam Pattern. Every year, MPSRLM releases a large number of vacancies to provide opportunities to candidates who are seeking Govt Jobs in Madhya Pradesh. Hence, on our website, we therefore, provide all the necessary details & important notifications regarding MP Govt Jobs 2019. Also, for furthermore details, kindly login to the official website. Candidates must have M.Com, Degree/B.Com, Diploma in Finance/Tally Software. The application fee structure will soon be notified on the official website. Also, the mode of application is online. The selection procedure may be based on written test/interview. The selected candidates will receive a salary package of Rs. 23,000/- per month. Step 1 – First, go to the MPSRLM official website. Step 2 – Next, search for the advertisement regarding the Assistant District Manager Post & click on it. Step 3 – Read the Notification carefully & check your eligibility. Step 4 – Click on “Apply Online” & enter all the details correctly. Step 5 – Finally, take a print out of the submitted application form for future references. 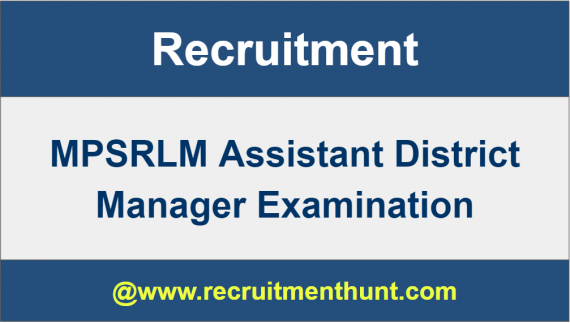 Finally, all the candidates can check the MPSRLM Assistant District Manager Recruitment Notifications here. Hence, applicants can furthermore, make their preparation easier by following the MPSRLM Assistant District Manager Previous Years Question Paper. Therefore, download MPSRLM Exam Patterns along with MPSRLM Assistant District Manager Previous Years Question Paper 2019 on this article. Also, for more State and Central Government job updates do subscribe to our site Recruitment Hunt.